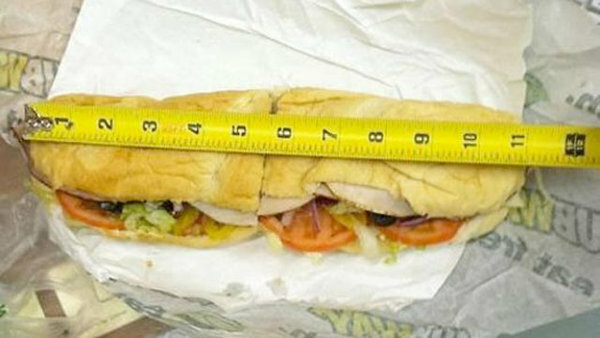 Yes...apparently there is an uproar when some guy in Australia actually measured his foot-long sub only to discover it was an inch short and then posted this picture out on Facebook asking Subway to comment on it. This cannot be the first time somebody has claimed their "product" is longer than it is. I noticed no woman filed this complaint. They've probably known for years but have been so conditioned to do the conversion to reality that they never really thought about complaining. Oh, and that raised additional concerns that Subway hasn't been packing as much meat on them as well. No wanting make myself sound slutty or anything but I did go out with a guy in order to check to see if the rumors were true. Rumors that he was, in fact, part horse. He was. I was so scared of that thing getting anywhere near me that I ran screaming for the hills! Oh dears. WHAT have I tuned into here? Oh, size matters. Um, my cat is most offended. His "sandwich" is very tiny. How do we know? Well, er, because he likes to lick it. Sigh. Oh my, I actually think the comment about size from TIW is funnier than your post, which is a rare occurrence. I mean if you look at the sandwich you can see where the roll was scrunched up just a bit which does happen to bread and rolls. I think that maybe we all ought to add a small measuring tape to our key chains so that when we are out and about we can measure everything. And keep one beside our beds too for just in case someone is exaggerating. mrsupole - key chain tape measures...the new fad! The key for happiness is not to find a perfect person, but find someone and build a perfect relationship with him.